In this example we will configure a SIP trunk between the Avaya IP Office and LES.net using a static IP address assigned to LAN1 behind a firewall/NAT. Alternative configurations would include registration which is supported by LES.net for users with a dynamic IP addresses or you could assign a public IP to the IP Office on LAN2 outside of your firewall/NAT. First we need to obtain the IP address of the LES.net SIP server. Because the IP Office does not use DNS to resolve the name of the SIP server you will want to use PING on your PC to resolve this name. From your computer enter ping did.voip.les.net from the command line (CMD) and make note of the IP address that is returned. From this point on we will use 64.34.181.47 to refer to the LES.net SIP server. The IP Office will need a number of ports opened on your firewall in order to properly communicate with the LES.net SIP server. You will need to insure that the following ports are open for both inbound and outbound traffice, without restriction. NOTE: The RTP range can be modified under System>LAN1>Gateway if requested by your provider. Ensure that you have a default route created in your IP Office under IP Routes that points to your LAN1 interface. Once you have properly configured your firewall/NAT and your IP Office has properly recognized your public IP address via STUN and sees all necessary ports open you can proceed with configuring your peer/trunk with LES.net. We will skip most of the basic signup options for Les.net however you will want to start by visiting http://www.les.net and selecting the Sign Up option on the left to create an account and create your inital Trunk/Peer and select your DID(s). 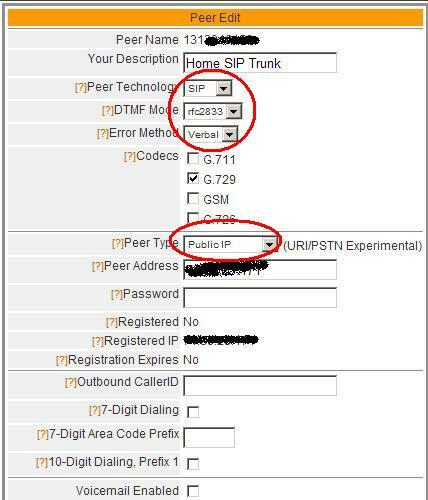 After you have created your Trunk/Peer you will need to configure it to use your static IP address. 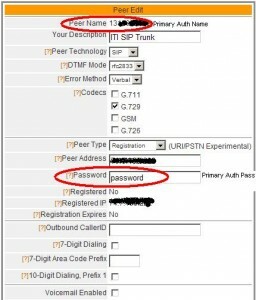 Login to your LES.net account and click on the Peers / Trunks option on the left and click the “Edit” option for your Peer Name.Set the options to match the picture to the right making sure to select “Public IP” as your “Peer Type” and enter the IP address that you obtained via STUN in the step above as your “Peer Address”. You can enable G.711 as well, if you wish, however G.729 is typically the best option for voice conversations over the Internet. 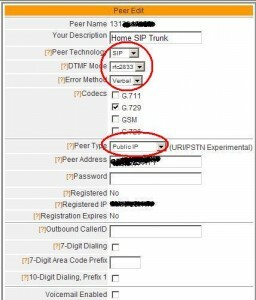 If using registration (such as with a dynamic public IP address). Now here is where we get a bit unique. There are a number of ways to handle your SIP URI and none of them are wrong. 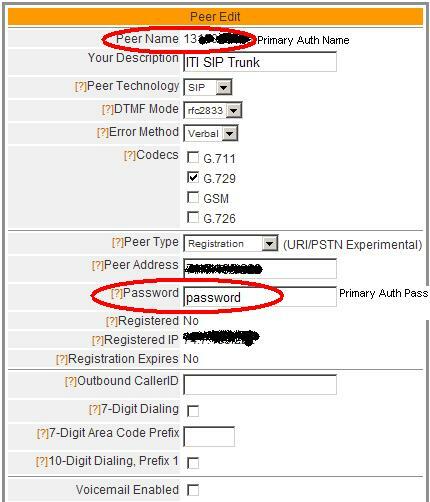 When an inbound SIP call is sent to the IP Office the destination/called party is checked against the list of URI in the system to insure that the IP Office should handle the call. The system doesn’t use this information to actually route the call, it simply checks to see if the called party belongs to the IP Office. Every DID you own must be entered in the IP Office somewhere as a URI or the call will be rejected by the system. There are two places to enter a URI. You can enter the information under the SIP line itself, which requires a reboot to modify. Alternatively you can enter URI information under a user’s SIP tab which can be modified and saved as a merge. The same URI information can also exist in multiple places. In order to avoid reboots we will use phantom users to enter URI information. 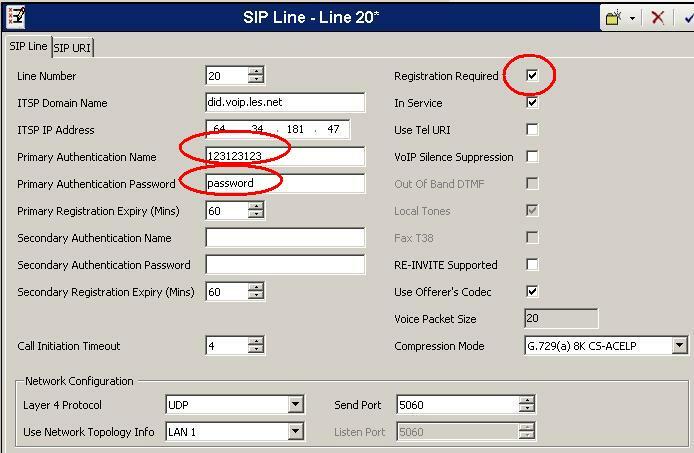 Under your SIP Line click on the SIP URI tab and then click on the [Add] button. Typically you would enter your DID in the three drop down fields and repeat this step over and over for each DID that would not be associated with a specific user. Instead we will select select “Use User Data” for each of the three drop down fields. You will also want to assign an appropriate incoming and outgoing group ID for this line. Next we must add our URI information to allow for incoming calls. Right click on Users and select new. In the Name field enter URI followed by the DID number (I start with URI as you can not have a username that begins with a numeric digit). I also enter a description for the DID under the full name field although this is completely optional. You may leave the extension number blank as it is not needed. Now select the SIP tab for this user. This tab was previously hidden and is only available once a SIP line has been created and a SIP URI exists with the “Use User Data” option. Remove all but the numeric DID information from all three fields. And now your individual users. For each actual user you will also want to set a URI. Either a unique DID for that user or a main telephone number that may be the same for multiple users. This will be used to display the outbound caller ID when that user places a telephone call. Again this information is NOT used for inbound call routing. Finally we need to create our incoming call routes. This is no different than the incoming call route you would create for an ISDN trunk. Enter your line group ID, number and destination. No special domain or SIP information is needed. NOW SAVE! Save your configuration and reboot your IP Office and you’re ready to test! Unfortunately at this point it probably will not work. Out of the last several system’s I have setup with LES.net I have had the results when making my first outbound call. A recording saying something like “one zero zero, your peer is not configured correctly, one zero zero”. But do not fear! We have a solution! Once they have configured your username to be your peername in their database all should be good.